For those who don’t know, Roo was born with genetic abnormalities & was rescued by someone who witnessed him cruelly being thrown into a lake. He was adopted out shortly after, still a kitten. Three years later he was returned completely emaciated. He was missing patches of fur, skittish, & in an adoption room surrounded by gorgeous cats. He sat at the shelter, skipped over for 6 months until we met him, and fell in love with all of the reasons that one person literally threw him away & another neglected him, returning him like a defective product. Where they saw deformities & some neurological challenges we saw uniqueness and a sweet personality that was dying to be loved… a cat that deserved a chance! 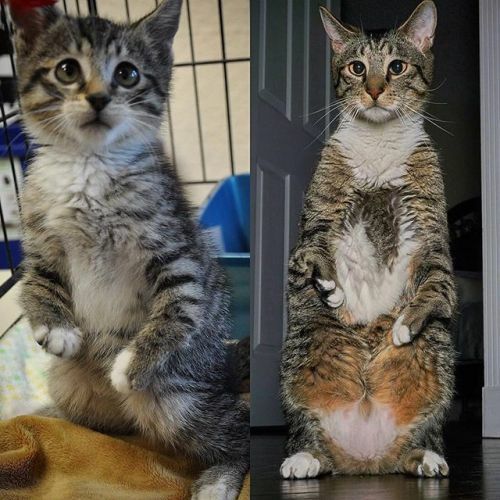 He has a condition called radial hypoplasia which is why his front legs are bent, & has abnormally large rear legs so he can stand up steady. He has crossed eyes, big ears, & a crooked tail but we ❤️ all of those things about him! We chose him for the very reasons others looked away. Posted in Cats of Instagram and tagged Cat Breeds Cat Health Cat Information by cnkguy with no comments yet.